Seems to be about that time of season where Advent-type people make sporadic re-appearances, if only to dispel potential rumors of their demise. Power(S): Brooklyn has the power to read other's thoughts, emotions, and futures when they sing. She also has the power to control her voice to such a pitch that she can shatter objects. Once, this extended to, like, MASSIVE GIANT BRAIN EATING TECHNOPATHIC ROBOTS~, but these days store windows are about the best she could hope for, and her powers towards organic beings only go so far as making them hold their ears in pain for a minute or so. Appearance: Brooklyn tends to cut energetic paths through life, and her body even somewhat resembles the blade of a particularly pretty knife - 5'7 and slender, with her family's sharp features and thin smile in full effect on her tanned face. Her hair tends to be the frame for the Ultimate's lovely visage - naturally a coal-black, she dyed it and cut it for her first ever cosplay months back, and as it grew in decided that she liked the blend. As such, her hair is now a pink-and-black swirl of color slipping down to the middle of her back, and she finger combs it and tosses it over her shoulder constantly. Brook tends to wear relatively fashionable, form-fitting clothes not unlike those her brother loved - in fact, when not pairing a black-and-slate knit beanie with her favorite leather jacket, she often wears one of her brother's old blazers over top of a black tank top that curves along the middle of her navel, disguising one tattoo - the CARLISLE atop her navel - and revealing another - a Facebook thumbs up beside the scandalous challenge 1 like if I make your yang xiao long! She also has a bullseye to the northeast of her torso, and along her clavicle are small, shaky words in her own hand, clearly amateur tattooing work of her own. Personality: Cocky, brash, and loud, Brooklyn is a cutie with a zest for life and a head full of insane ideas. Usually perky and upbeat, she's nonetheless gotten a bit of a taste for a good fight from her time in her home universe. She's perfectly willing not to show someone a lick of mercy if she thinks it's gonna bite her ###### letting them up. In addition to her survivor's personality, her life has largely been overwhelmed with the one looming mystery that still remains to her - the location and survival status of her big brother, and what, if any, clues about his family ring might exist in this world that could have spelled his salvation. And if she never makes it back home with any information she finds...not like it'd change anything. Weakness: Brooklyn is no hyperkinetic like her brother; she's been trained to fight hand to hand, sure, but she's still a skinny young girl of five and a half feet, and she's going to get tanked by any berserker worth his salt. Bio: Brooklyn has come far from her days of riding around in her brother's Corvette, photobombing people from the shotgun window with a large TAG ME BRUH whiteboard between her hands. Under that very same brother's tutelage - and with the help of one particular long-sufferingly chaste friend - the one-time child actor became a surprising asset in the Phalanx War, her keen sense of hearing pointing out would-be ambushes and her voice being known to shatter a wave at a time when properly rested. Her brother's supposed loss, however, left her despondent, wondering why his alleged super-duper-Satan-stumper ring hadn't brought him back to her. Trying to balance an investigation into the supernatural workings behind the ring with winning the war, Brooklyn stayed behind while Alec led a team to search for Alex - however, when the Ultimates started to filter back into the universe they'd struck gold at, Brooklyn was quick to follow Rebekah. This dedication to her friend was met only with the bamboozling decision to make Dallas Green de facto leader of the Ultimates. The thought of someone who had only accumulated 400 Instagram followers - foreign universe or not, that's no excuse! - replacing her older brother was inconceivable. With this in mind, and aware that her presence there was only causing prolonged sexual Ramadan in the other female Ultimates, Brooklyn dicked off quicker than a campaign promise, intent on finding somewhere in the continental 48 where an Ultimate girl could settle down for a couple years and adjust to life without invading pod people. She quickly found her way to California, where she spent several months researching anyone who might have known a version of her brother that was still in the area. She even camped out a few weeks at Jenna Carlisle's house, fishing for information in the rings, before realizing that any info she found wasn't going to be on the West Coast. On her way through the San Francisco Bay, however - in fact, in one particular Starbucks - she heard various rumors of kids who had been staying in the area and dabbling in magic - even a thunderbird, which Brooklyn tried, to her eventual chagrin, to argue had nothing on Ric's old 'Vette. So she made her way back to the East Coast, hoping that in grand old New York City, in typical X-Men fashion, she'd find someone kooky enough to be able to tell her what the deal was with her brother's ring, and what might have caused it to stop working - or, if it had worked while she was away, what had taken it so long. Buuuuuut that doesn't mean she's not open for a little fun fun fun burning her way across country. Okay so to clarify about the plan House Gonzo Hellfire has, is the gala a recruitment drive, or just sort of an opportunity to show off our sweet digs to everyone who doesn't get to live there and watch Borte Khan traumatize the alligators? I need to know because this effects whether it's appropriate for Cynegild to wear the shorts with the duckies. So I'm posting this as a divider. Clag has another profile he'd like looked over. Loyalties/Faction: Currently works at the Starbucks in the New York headquarters of the Hellfire Club, known, depending on the rank of the person describing her, as “the coffee overlord” or “Starbucks girl.” When between jobs, acts as a roving freelance problem-solver, solving any problem that can be dealt with by a walking entity of sass that carries two swords older than her grandmother, excluding problems that involve murdering your wife/housekeeper/neighbor’s parakeet. Power(S): None, really. Sass isn’t actually a power. Appearance: A barbed-wire thunderstorm of a voice wrapped in the trappings of a punk rock biped. She stands at 5’6” with warm, sepia-coloured skin, narrow shoulders, wide hips, and a lean, well-muscled build. She shaves the sides and back of her head bald, allowing the rest of her shiny black hair to grow long, and tying it into a three-foot long braid that hangs down her back. She has large, strongly tapered (very narrow near the nose, wider away from the nose) eyes, with terra cotta (brownish-orange) irises and dark eyebrows that are only very slightly arched. She has a somewhat large, slightly hooked nose, round cheeks, a small mouth, and a small chin. She has many facial piercings, all of them gold, including three through her right eyebrow, three in her nose, multiple piercings in both ears including a ring in her right ear from which a fine gold chain can be hung to the ring on the edge of her right nostril, and a set of “snakebite” lip piercings. The aforementioned gold chain is removed for fights, but otherwise worn pretty consistently. When dressed for a fight, she wears a baggy reddish shalwar (similar to the pants that inspired “harem pants” in English-speaking countries) paired with a set of comfortable brown canvas combat boots that come most of the way up to her knees. Her shirt is a comfortable black shirt roughly similar to the kameez traditionally paired with a shalwar, though this specific shirt has sleeves that are cut to be quite loose at the shoulders (for flexibility) but tight on the arm itself, and which end just above the elbow, along with a long rectangle of loose cloth that hangs down from the front of the waist of the shirt to halfway down her calves. Over this shirt, she wears a blood-red sleeveless jacket cut akin to an 18th century European military officer’s coat, with no sleeves, an ostentatiously popped collar, and gold fastenings down the middle of the front. She typically keeps the coat about half-unbuttoned from the top. The belt for her Ayda Katti is fastened just below her chest, while her Urumi is belted over the coat just above her hips. When she is not ready for a fight, she either wears her Starbucks uniform, or it’s a toss-up between t-shirts and black cargo pants or any of a variety of Indian casual clothes. When at work, she wears her Talwar on her belt, because you really never know what’s going to happen at Hellfire. Weapons: An Ayda Katti, a short, heavy sword originating with the Kodava people of southern India, with a leaf-shaped pommel carved from the horn of a water buffalo, on the end of a hilt carved from the same material, with gold inlays covered in decorative floral etchings. A tassel hangs from just below the small, square guard. The blade has a concave cutting edge, while the duller back of the blade starts slightly concave before rounding out to become quite convex. It is a weapon made for chopping, not thrusting or slashing – it strikes heavily and cuts deep, but it is nowhere near as fast as a rapier, and the lack of a sharp, straight point makes it much less useful for thrusting into the gaps of armor than a European greatsword. The Ayda Katti is held, when not in use, on an elaborate, tasseled belt that she fastens high on her waist. 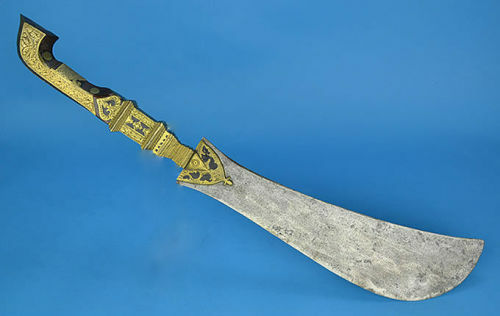 A single-bladed Urumi, another sword made in the south Indian state of Kerala, made with a long, flexible band of steel and a much more traditional hilt and guard than the Ayda Katti, though the pattern of gold inlays is very similar on the hilt to what is present on her Ayda Katti. When fully straightened, the blade is 60 inches long, though it is more inclined by design to curl, and the sword is in fact worn as a belt when “sheathed.” The Urumi is a difficult weapon, functioning somewhat like a steel whip, and in inexperienced hands it is more likely to cut the user than the intended target. Garima keeps hers belted below the belt for the Ayda Katti, resting just above her hips. Her Talwar, never paired with the other two swords, is a curved sword of a type that saw widespread use in India, and has a handle similar to that on the Urumi. Like the other two swords, it has rich gold inlays on the handle and scabbard, as it belongs to the same set and was made, many years ago, for the same original owner. Skills: She has trained rigorously and consistently in the modern form of the southern style of kalaripayattu, an Indian school of armed and unarmed martial arts. This required training both alone and with a sparring partner; training in empty-handed techniques (adithada), which bear some similarities to kickboxing and Muay Thai, and include a focus on both grappling and striking, along with a study of pressure points; and training with a variety of weapon-types, building up in difficulty from a short stick through daggers and swords to the Urumi. Her skill with weapons other than the Ayda Katti and Urumi has waned somewhat through disuse, but she keeps in practice with hand-to-hand, and will often fall back on it when a less-than-lethal solution is called for. Her focus on training to fight has left her with little time for more artistic pursuits, but she has found some time for music, and while she does not play any instruments and has difficulty reading music, she has found that she is naturally gifted with an unusually wide vocal range, able to sing lower than some men while still keeping the high end of her range fairly high. She has applied this talent to her interest in metal, and she will sometimes sing in combat, both as an intimidation tactic and to disguise her breathing patterns, making her moves less predictable. Personality: Garima is, as mentioned before, a walking entity of sass. Sarcastic quips, stunningly theatrical eye-rolls, and more all fit into her standard vocabulary for self-expression and, particularly, for relieving frustration or expressing dissatisfaction with a situation. She is, truthfully, much less sarcastic when comfortable and happy with a situation, and is generally rather polite and compassionate with people she likes and respects. When having fun, she can be quite loud, talking about whatever pops into her head and gesturing wildly, sometimes managing to tell a whole story with hand-gestures. When things are more emotionally serious, she prefers to listen to and attempt to fix the problems of others than to speak up honestly and trust someone else with her own personal concerns. All that being said, if someone says or does something that offends or hurts her, they will know about three seconds after they do it, and she will straight-up suplex a bear if she’s angry and thinks that’s what needs to be done. Quite apart from its utility in solving certain kinds of problems, fighting – or really, any kind of intense physical work – can be something very enjoyable and relaxing for her, and she takes great satisfaction from the experience of sparring with someone she knows, someone who trusts her not to hurt them and whom she trusts in the same way. She is also very disciplined, and does not ‘forget’ to practice something she cares about – if something else takes priority, she’ll take care of business and make no excuses about it, but she does not miss hand-to-hand practice or practicing with her voice because she doesn’t feel like it or slept in or any other trivial reason. Weakness: Like any unaugmented human, she is mortal and can be killed in a number of different ways – severe head or spinal trauma, a bullet to a vital organ, decapitation, exposure to a number of different toxins… the list goes on. In more specific matters, two of her weapons are restricted to hitting targets within at most five feet of her, and while the Urumi has a theoretically longer reach, it is still not a true long-range weapon, and cannot compete on a level with guns, fireballs, or other true ranged weapons. To compensate for this, she tends to rely on support from gun-wielding allies to take care of opponents she is not properly equipped to fight, so that a HYDRA soldier cannot simply recreate that one scene from Indian Jones. Beyond that, she tends to be quite impulsive when deciding whether to fight, and may overestimate how well her own strength compares to an enemy’s. Bio: Devarmani Aagneya Garima was born in the port city of Kochi in the state of Kerala in southern India. Her mother’s side of the family traced their lineage back to a successful 18th century pirate named Devarmani Agnimurkha Amita (though some in the family maintain that this was not her birth name; given that Agnimurkha is the name of a flea in a popular children’s tale and Amita means “infinite,” it may have been chosen by her as a statement on her rise to power from humble origins) who raided British trading interests and the holdings of wealthy rulers throughout the Indian Ocean. The pride in this ancestor is such that it has become a tradition for her female descendants to only marry men who will agree to take their name instead of the other way around, and that her swords are passed down from mother to daughter (though her flagship, a Chola thirisadai that was ancient when she first set sail, is lost and a popular bedtime story in the family tells of a hoard of treasure buried with it). Garima is the middle sibling of three, with an older sister who was more interested in studying physics than in taking up the arms of her ancestor, and a younger brother who was just as enthusiastic as Garima herself when it came to playing with swords. Her mother told the growing children tales of their seafaring ancestor’s exploits, and, when they were old enough, her uncle began teaching Garima and her brother how to fight, starting with the basics and working up as they got older. When Garima was 12, her family (including her uncle, a disabled army veteran) moved to the United States for job opportunities and a more financially prosperous future for the children. Garima and her siblings attended public school, and her uncle helped them practice speaking English. She and her brother continued to learn kalaripayattu, and, over the years, Garima worked her way up to learning how to use proper weapons, though it was not until she was 20, on a break from college (where she majored in history and was deeply unimpressed by the overall focus on western Europe and post-colonial America) that she and her uncle agreed that she was ready to begin learning to use the urumi. After completing college, and her training with her uncle, it was acknowledged that she had earned possession of the heirlooms of her ancestor, and she left home with what were now her own swords. With a lack of available jobs in history, she drifted for a while, eventually getting caught up in some supernatural happenings near Chicago, where she met and briefly worked with a magic-user named Aramis Saavedra, though they parted ways not long afterwards, with Garima remarking that he was too careless to work with safely. She took on a few jobs handling otherworldly problems here and there, taking ‘honest’ work where she could find it, before she finally found an employer that was willing to hire her with decent pay – the coffee shop in the New York headquarters of the Hellfire Club, a coffee shop that she soon came to realise had no more to do with Starbucks, in terms of management and oversight, than the Wild Wings breakfast menu had to do with sanity. So of course, as soon as I start trying to stage a comeback, my internet gets shut off. internet should be back soon though! Successful recovery of internet is successful. The comeback continues! Edited by . :The Abysswalker:., Sep 17 2015 - 06:20 PM. Power(S): Firebending: Ohen can generate and control fire, and to a lesser extent, heat. He can turn his body into a living flame, and use this power as a sort of flight. Lighting: Ohen can generate and direct electrical charges, including traditional lighting, heat lighting, and ball lighting. Teleportation: Ohen has limited control over a line of sight based teleportation. It takes a lot of energy to do perform this power, the farther he travels the more energy it uses. Appearance: A bit over six feet tall, Ohen looks slightly different from the 'normal' view of superheroes. He's not full of rippling muscles, nor does he have a tight figure. He's larger than the traditional view would imply, almost like the Pillbury Doughboy. His costume is form-fitting, which may be a ploy to distract opponents, and quite garishly colored. Mainly orange, with electric blue stripes along every seam and two lightning bolts crosses across his chest. His hair, when powers are active, is a raging inferno, though a well-kept crop of dirty blond otherwise. He has a round, kind-looking face. Skills: Though not a superpower, Ohen is deceptively strong and quick. His frame leads people to underestimate him, and he uses that to his advantage, often lulling people into a false sense of what he can do, before surprising them with his speed or strength. Personality: Ohen loves life. Upon discovery of his powers, he took to them like a fish to water. He loves to show off, to test his limits, and sometimes to simply do nothing but enjoy doing nothing. He is fiercly loyal to his friends and family, and will not tolerate anyone crossing those he considers his. He works very hard to keep control of his temper, but the one thing that will set him off every time is hurting someone he loves. Weakness: Intense cold and wet are his two major weaknesses, the first being a counter for his firebending, and the second messing with his lightning generation and his ability to control fire. In small amounts, neither is very dangerous to him, but get cold enough, or douse him in enough water and he becomes very weak. In addition, his 'living flame' form, while useful, is likely his weakest. It consumes a lot of oxygen, so if he raises too much in altitude, or gets caught in a storm, or even flies through too dense a cloud, he could snuff out his own body, which could possibly kill him. Bio: Ohen is a second-generation American, his family coming over from Eastern Europe before he was born. Unbeknowst to him until much later, his family agreed to let a group of scientists perform a couple of experiments on him as a baby in exchange for stability in their new home. He does not know the extent of these tests, but he suspects they are the source of his powers. He has entertained the possibility of his powers coming from the mutated gene that gives the X-Men theirs, but he prefers his version of his history. What's the max on his teleportation? Anything line of sight? Anything he has a clear picture of in his head? Line of sight, with a maximum range. He couldn't, say, go to the International Space Station and teleport to anywhere on the half the earth he can see, but he could teleport probably a mile or so down a long, straight road on a clear day. A pictured location would take way too much energy on his part to pull off. Sounds good to me. Approved x1. Awesome! So may I ask, where is a good place to get involved in the story? Especially for an unaligned hero. To be perfectly honest, that's an excellent question. We're working on getting the plot into gear again in the near future, but for the moment it's a little stagnant. Your safest option is probably to drop them somewhere in the New York area, and chances are there'll be an open character somewhere to send their way. So, what exactly are the protesters outside Stark Tower all about? Ohen may be walking in blind to that, but I feel like I should know what I'm sending him into. Well the simplest explanation to that is Tony Stark had a son named Howard Stark, who became the next Iron Man in this rpg's version of the avengers, Howard ends up getting killed in one of the many HYDRA attacks that New York has been plagued with. A year or so after this, Howard returns as an evil HYDRA undead cyborg and attacks the SHIELD Helicarrier with a bunch of iron man suits. This is basically why people don't like Stark Industries right now, or the Stark family in general. Edited by Cirilla Fiona Elen Riannon, Jan 14 2016 - 03:18 PM. Would love to know where things are going with the Hellfire Gala. Pretty much all of my plans are for either during or after it, at this point. Until then, I suppose I'll start drawing up another Congo post. Hi guys... I'm back, what have I missed.